REVIEW: Is The DJI Mavic Air The Best Drone For Travel? “Holy crap – this thing is freaking tiny!”– that was my first reaction when I opened up the new DJI Mavic Air for the first time! The latest drone by the crew at DJI comes in an insanely tiny (and stunningly beautiful) design and packs some serious punch in the tech department. What’s The Mavic Air Like To Fly? How Much Does Mavic Air Cost? Despite being almost as small as your smartphone the Mavic Air is packed full of incredible tech and although some of this is already standard across the DJI drone range the Air did come with some significant new upgrades. There’s A Lot Packed Into It! It’s amazing that all of the above features come packed into a drone that weighs nearly half of the Mavic Pro and folds down into a size that’s actually smaller that the Spark! Super Stable – Even With Wind! One of my biggest concerns about the Mavic Air was how it was going to handle in the air given its size. 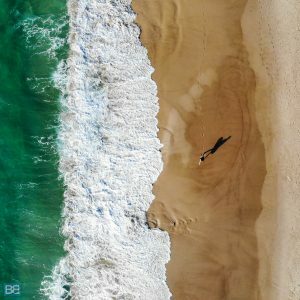 I’ve got used to flying the Pro which is incredibly stable and can handle a fair bit of wind without too many issues and stability was my biggest issue when reviewing the Spark – it just didn’t fly how I needed it to fly and it did feel less stable. I shouldn’t have been worried though – the way the Air handles mirrors the Pro perfectly! 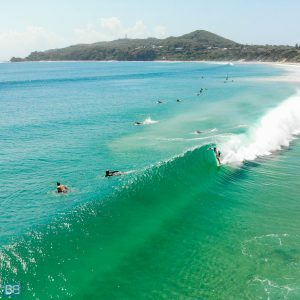 It’s responsive, stable and can handle the wind with ease – something I really put to the test whilst shooting the surf and the headland in Byron as there was a pretty hefty offshore wind! In standard mode it does feel slightly sluggish with ascent and descent speeds (although admittedly I think I just have to tweak some of the settings to remedy this) but in regards to approaching video and images it’s a dream to fly. 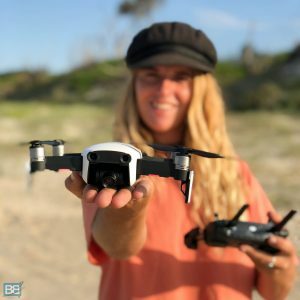 The real fun though comes when you flick it into sports mode and the Mavic Air really comes into it’s own – this thing is fast, but still retains shooting stability – ideal for shooting tracking shots along the beach, keeping up with dive boats on the move or shooting surfing! Basically if you’re used to flying the Mavic Pro or any of the Phantom series you’ll barely notice any change in flight style when using the Air. Well Worth The Cash For Shots Like This! So how much does all the tech set you back? Well admittedly yes, this isn’t going to be the cheapest item on your packing list, but you knew that already! 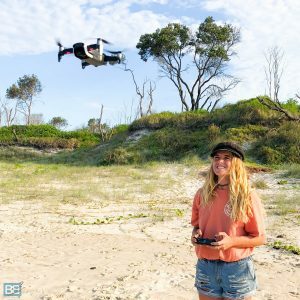 The Mavic Air starts at £769 ($799USD or $1299AUD) or the Mavic Air Fly More Combo is currently reduced to £949 ($999USD or $1599AUD) – which then includes a bunch of extras like 2 extra batteries (so 3 total), some extra propellers, carry bag (which is surprisingly compact and beautifully made!) and a battery charging hub. And given the fact you’ll want at least 1 extra battery the fly more combo is certainly a wise investment – so I you do have the cash that’s what I’d personally recommend going for. 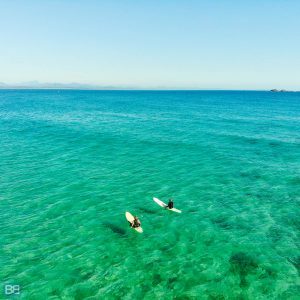 When it comes to the best drone for travel there are now 3 main contenders to choose from in the DJI range – the Mavic Air, Mavic Pro/Plantinum (check out my full Mavic Pro review here) and the Spark (check out my full Spark review here). When it comes to specs both the Air and the Pro blow the Spark clean out of the water, both shooting 4k and also having the 3 axis gimbal which ultimately results in much smoother and clearer footage. And size wise folded up the Mavic Air is almost the same size as the Spark. Basically unless you want the most affordable option the Spark is pretty much off the table. That being said as a first drone or for someone who wants the most affordable option (although admittedly the controller brings it to nearly yet same price as the Air) the Spark is still not going to let you down, but if you have the money to upgrade do it! So the real fight here is between the Mavic Air and the Mavic Pro/Platinum. At £130 more expensive you’d think the Pro would win straight out. But in actual fact the Mavic Air matches (or beats!) the Pro/Platinum in almost every specification! It’s faster, lighter, smaller and boasts the addition of backward sensors and more advanced object avoidance! And for most people the flight distance isn’t something you’ll ever be that worried about! Honestly I’m going to straight out say that the Mavic Air is now the best drone for travel. The combination of weight and size alone make it an incredible drone to travel with but add to that with the same technical spec as the Mavic Pro and the new addition of the backward sensors and it’s a no brainer on the decision. And you’ll even save some money (v the Pro/Platinum) in the process! 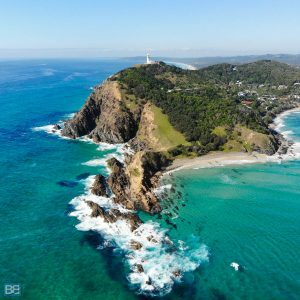 Right now the Mavic Air is my new favourite drone to travel with (I’ve gone as far as selling my Mavic Pro already!) and it’s a welcome addition to my camera kit! …the only thing I would keep in mind though is that since the introduction of the Air has pretty much knocked the Mavic Pro out of the park I’d say it’s not long until we see the launch of the Mavic Pro 2 – which will no doubt include the additions the Air has brought to the table but I’d hazard a guess that it’ll boost the frames per second in 4k and 2.7k (maybe even match the GoPro Hero 6 at 120fps in 1080 and 60fps in 4k). So if tech specs are your main priority hold onto your Pro and upgrade to the Pro 2 later in the year. But for anyone else – the Mavic Air is more than enough drone to capture all your adventures! Click here for more info on the Mavic Air and to buy yours! Thanks for the awesome and in-depth review. I have been looking at drones for a while now. This is a little bit more than what I was planning to spend, but it looks worth it. This drone is looking good but the price is deterring me from a purchase. I think, it is okay to pay such prices when you are a full time travel blogger but not proper for others, right? It’s an amazing drone, but not the cheapest. I guess it depends on what you’re using it for an what budget you have. 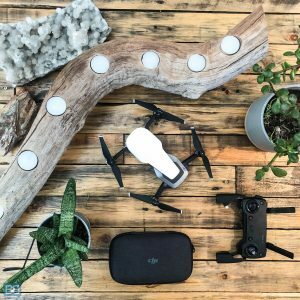 If you’re looking for a more budget friendly option check out my review of the DJI Spark – let me know which you decide to go with!